Victorian ships Lantern FC1 sits proudly on the frontage of 1a Court Square, a colonial treasure picked up at an antiques market, a reminder of Galle Fort’s golden age of trade. The 17th and 18th Century were a magical time on the Silk Route of the Sea when ships lanterns at night would have illuminated the way to the island of Serendib and Galle Fort harbour, where they would trade in spices and gem stones. The owner of 1A, Court Square, Galle Fort, bought one such lantern for fun over 15 years ago and many other beautiful pieces of furniture at various embassy auctions, each one crying out for a home with the same wow factor. 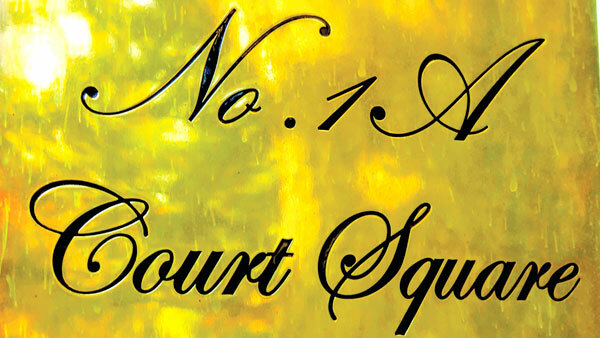 So what started as a love of collecting stunning antiques, including the original vintage Bakelite wind up phones, ended in the marvelous creation of a unique bijou pied-à-terre 1A Court Square. A magical spot that overlooks UNESCO World Heritage sites: fascinating three periods of colonial history starting with the Portuguese Black Fort, Grand Dutch House Akersloot and finally the Colonial built British High Courts. Sitting shaded in this charming one bedroom two-story suite, complete with its delightful balcony watching the ancient citadels daily life as I sip Ceylon tea, is like living a movie dream, maybe even better. By night it’s a peaceful escape from the hustle and bustle of the walled city’s main shopping streets and by day a hub of the country’s top lawyers, still using Remington typewriters, working on important cases, in courts built by the British in the 1920s. One feels the legal history the moment you step through the door, into a corridor with wonderful inner doorways that lead to a stunning mosaic bathroom and finally a spectacular bedroom on the ground floor with white marbled floor and clever cupboards set into the old stairwell hiding the TV and fabulous linen. Walking up the restored historic staircase to the first floor, one can’t fail to have one’s breath taken away by the views and delightful décor of the place, which includes vibrant flags of Ena De Silva and Barbara Sansoni’s line drawings of The Dutch Reformed Church and fort street life in 1970s. One can enjoy looking out through the Banyan and Mara trees at the mysterious Black Fort next to the district court which is still very much in use. Look to the far right and you will discover Akersloot Bastion with a very grand mansion built in 1759 and next to is the popular fine dining outlet of the Dutch Hospital complex, which is a heady mix of trendy bars and well appointed restaurants with splendid panoramic views of the port and the scenic hills of Rumassala. If the trees could talk they could tell some incredible stories about the maritime history of the area and walking through them is a joy as they keep the square cool during the heat of the day. The Maritime Museum opposite the apartment suite was once the magnificent cinnamon warehouse and now a curated space of fascinating heritage history. The Banyan trees with gods hidden in the branches to the left of the apartment are a place for people to reflect and pray for a good result from their case. I also learn how the wood of the rainforest Mara trees directly outside the 1a Court Square were grown to burn the wood as coal for British steam trains, that ran from Galle to Colombo. Just below the balcony sits the antique lantern in pride of place looking like it has always been there and in a way it is as close as one can get to the Galle Bay and old trading port that made this the central port of call in the 17th century. The owners love the Dutch period architecture, beauty and history of the fort itself, have a deep desire to have a footprint in the area of the Fort/Rumassala after his mother sadly lost 9 acres of ocean view land in the 1960’s to the government, for village expansion. His deep attraction to the beautiful south was further influenced by the Galle Literary Festival architectural tours with undeniably the country’s most romantic and brilliant architect, Channa Daswatte. After many architectural adventures he took the plunge in the most unlikely of places, Law Court Square. Call it what you will the passion, the hunt and the drive to find something special. In the end he was lucky enough to buy a tiny 1.3 perch property that had belonged to the eminent Weerasooriya’s family of lawyers hailing from the colonial South since 1826. Nothing could be more marvelous than overlooking the old law court square in the previous legal chambers of a prestigious legal family, where high profile cases are tried from Monday to Friday. Everything, you will discover walking through the old city, has a time, place and whilst exploring the area and fabulous historic buildings, a legal Clark it seems showed the owner this tiny spot. “I went into a darkened room and walked up to a temporary narrow staircase to some wobbly floor boards, which I nearly fell through and thought this is it.” His dream was to get his friend Channa Daswatte to design a single suite and strangely the day he made the purchase was on April 28, which was coincidently on what would have been his mothers 77th birthday. Every piece in the family antique collection in their homes has been put to good use. My favourite one in 1a Court Square is the tiled 200 year old writing table from Badulla, which was the owner’s father’s great grandfather, overlooked by the fabulous copy of the painting by Donald Friend. An imaginary view of what the Fort would have been like in its heyday of trading framed by large antique timbers hewn from forest logs. The mirror in the bedroom is from the French embassy and the vanity table is from the Italian embassy, each one reflecting the multi-cultural nature of the old trading fort. The antique four poster bed is magnificent and like the red retro SMEG fridge upstairs, it is just one of many fun aspects about this pocket sized merchant apartment that is part of a massive renaissance of this ancient sea fort city. As the country grows as a destination, Galle Fort is the talk of the island with its raucous elation of all the exciting new ventures. You can see even the sluggish giant monitor with its lazy gait crossing busy roads being drawn into this exciting new era of change. People have been drawn to Galle fort for 100s of years and particularly at its heady heights, when it was one of the greatest trading ports in Asia, where everyone of any importance traded or visited the ancient citadel. To Galle Fort, in its past, present and future forms - where soaring dreams are propelled by little feats and big hearts, nowhere right now is hotter or has more things for the romantic traveller to do. Go and make a booking for a few nights in this exciting new member of the Fortaleza collection of boutique hotels contacting [email protected].